Even with picture perfect teeth, you may still be unhappy with your appearance. 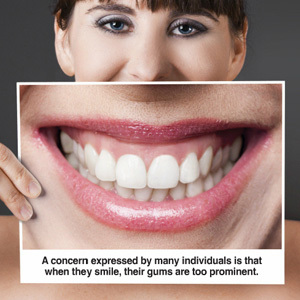 The problem: too much of your upper gums show when you smile. There’s no precise standard for a “gummy smile”—it’s often a matter of perception. As a rule of thumb, though, we consider a smile “gummy” if four or more millimeters of upper gum tissue show while smiling. In any event if you perceive you have a gummy smile, it can greatly affect your self-confidence and overall well-being. The good news is we can often correct or at least minimize a gummy smile. The first step, though, is to find out why the gums are so prominent. There are a few possible causes: the most obvious, of course, is that there’s more than normal gum tissue present. But the cause could be the front teeth didn’t fully erupt in childhood and so the gums appear more prominent. Other causes include the upper lip moving too far upward when smiling (hypermobile) or an elongated upper jaw that’s out of proportion with the face. Finding the exact cause or combination of causes will determine what approach we take to minimize your gummy smile. If too much gum tissue or not enough of the teeth show, we can use a surgical procedure called crown lengthening to expose more of the crown (the visible part of a tooth), as well as remove excess gum tissues and reshape them and the underlying bone for a more proportional appearance. A hypermobile upper lip can be treated with Botox, a cosmetic injection that temporarily paralyzes the lip muscles and restricts their movement. But for a permanent solution, we could consider a surgical procedure to limit upper lip movement. Surgery may also be necessary for an abnormal jaw structure to reposition it in relation to the skull. If, on the other hand it’s the teeth’s position and not the jaw causing gum prominence, we may be able to correct it with orthodontics. As you can see, there are several ways varying in complexity to correct a gummy smile. To know what will work best for you, you’ll need to undergo an orofacial examination to determine the underlying cause. It’s quite possible there’s a way to improve your smile and regain your self-confidence.